How to grow your own...and why! Genesis Chapter 1 verse 29. 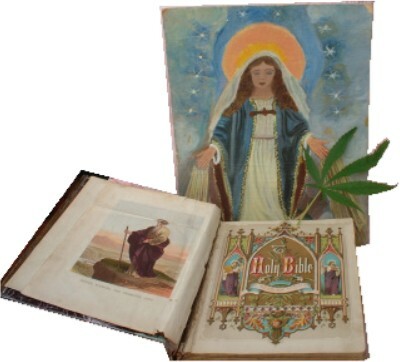 And God said behold, I have given you every cannabis bearing seed, which is upon the face of all the earth and every tree, in which is the fruit of a tree yielding seed: to you shall it be for meat. Save yourself pots of money every year, adopt a new hobby and live legally that's what I say. Imagine the delight of always having good grass instead of not knowing exactly what you are smoking. It will be difficult at first for you to comprehend this truth but the time has come for us to receive. Chapter 22 Revelations "The sacred leaf", that will heal the minds of the people. Happy are the people of the millennial . Says my 250 year old bible. One room or container which would need to be at least 5 feet wide x 10 feet long and 5 feet high. (The attic or cellar maybe). If your using metric and you don't know how long a foot is, try using the thing on the end of your leg for measuring purposes. Anyway its only approx. This place would be better if you lined it with polystyrene or painted it white to reflect the light. A place to grow cannabis your cuttings where a light can be on 24 hours a day. Or use daylight hours and put your light on over your cuttings as it goes dark. At least one 400 watt lamp. Two would be better. In fact any amount of lamps depending on the size of your operation. Don't go higher than 1000 watts, as if you're not there to look after your plants they could very easily dry out. So anyway, one lamp will do for about 15 plants, 2 lamps 30 plants. Metal Halide or High pressure sodium are best. One or two lights for raising cuttings Need not be very bright (anything from 40 watt plus. 2 x 75 watt full spectrum would be good. Strip lighting or fish tank lighting is ok Hang this lighting over your cuttings not much more than a foot higher than them is sufficient. 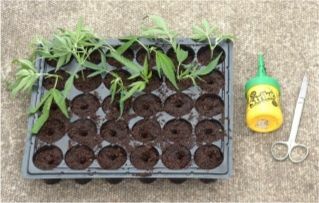 How to grow cannabis in seed trays, pots or bedding boxes, the type you buy Marigolds in are good for taking and keeping cuttings in until they root. As many 2 litre pots and 7.5Litre pots for transferring as you can fit into your grow room. Some people just transfer from cutting cannabis to grow bag to save work and money. Compost, multipurpose will do. Whatever you can afford and plant food. Plant food can be Baby Bio or tomato food. Make your own from seaweeds baths, or even find comfrey leaves and let them rot. Use the juice from the comfrey leaves watered down 20-1. 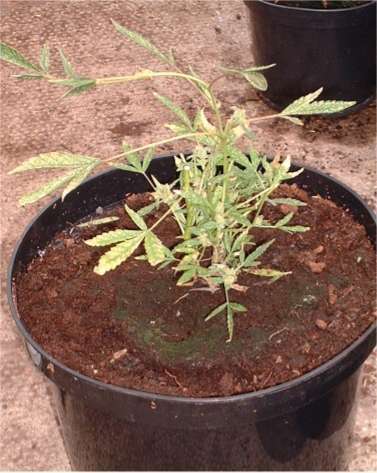 Cuttings from a known good cannabis plant is how to grow cannabis properly. Or seeds which we can plant until we find a good strong plant to take cuttings from. Plenty of good quality Water. I use Vortex energised Water because I believe my plants benefit greatly. They are always wonderful and bring me into really high states of spiritual awareness. In which states I have only ever been higher from one other source. Well maybe two, but who's counting. Its been great. The Vortex energiser, energises the water coming through the tap so there is no waiting around for anything to happen. Once you have put your energiser against your incoming cold water pipe that is all there is to it. Any water you use from that source will then have lost all memory of the chemicals which it has had to endure and the straight lines it has had to travel in. As water passes the vortex energiser it picks up the higher vibration emanating there and stores that instead. It becomes full of light and becomes alive again. Since using the Vortex Energiser I have become very sensitive to anything bad for me as soon as I touch anything bad I have a pain or bad feeling. Mobile phones just lift my skin I can not go near them. Same with additives and medicines and other chemicals. Fill your bedding boxes or seed trays with compost, make sure the compost has been broken down by rubbing it through your hands first, so its a fine crumbling consistency. Water and make a hole in the center of each cell to put your cutting into. Remove the leaves low down on the stem. Depending on whether you have perfect conditions, for rooting cuttings, will decide if you use rooting powder or not. If you decide to use rooting liquid or powder:- Dip the bottom of the stem, (up to and including the bit where the leaf or leaves where removed) into rooting powder or liquid. Then put the cutting into the hole previously made in the compost in the bedding boxes and firm the compost around the cutting. Water with water containing a little baby bio or plant food. Put under your lighted strip lights the 75 watt ones for 24 hours a day until new leaves appear at the top of the cuttings this could take 2 - 3 weeks depending again on conditions. Nice warm house for example. Make sure you check them every couple of days to see if they need watering. Do not allow them to dry out! When you see new leaves appearing this means the cuttings are ready for transplanting into your 2 litre pots. Fill your 2 litre pots with compost. Make sure the compost has been broken down by rubbing it through your hands first so it is a fine crumbling consistency. Make a hole in the middle of each cannabis of compost a little bigger than the root ball of your cannabis cutting and very gently ease the cannabis cuttings out of their original containers. Push them from the bottom rather than pulling them so much and put these into the 2 litre pots. Water with water containing plant food. Put these into your proper grow room under your 400 watt - 1000 watt lamps whatever you have. These plants need to live in 12 hours light and 12 hours dark. E.g.. 7am until 7pm lights off. 7pm until 7am lights on. It is important that the plants get no light during the 12 hours of darkness; otherwise it upsets the whole life cycle of the plant. Under 12 hours of light these plants will grow and begin to flower. Invest in a timer which will turn your light on and off at the correct time for you, but check regularly, make sure the timer is working. Water and feed as usual check your plants at least every 2 days. After 2 weeks you will see an amazing transformation. Now fill your 7.5 litre pots with compost again make sure the compost is crumbly. Only lightly fill the pots, don't go forcing as much compost in as you can and squeezing it down. Just fill the cannabis to the brim, and make a hole in the centre, the size of the 2 litre cannabis. Measure the hole by placing the 2 litre cannabis inside. 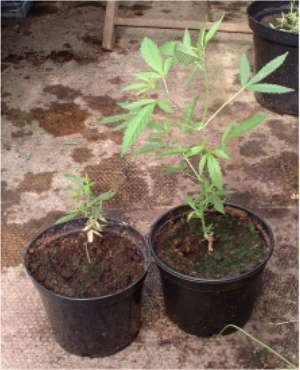 When you have the correct size, remove the plant from the 2 litre cannabis. 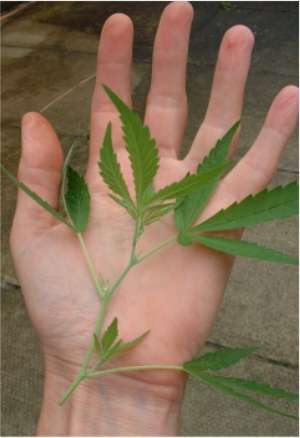 Hold the plant stem in between your fingers so that the palm of your hand is holding the top of the plant cannabis. Turn the plant upside down and push the bottom of the cannabis. 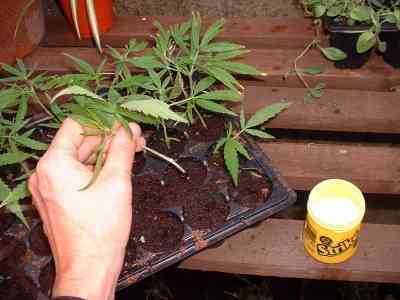 Place the plant in your 7.5 litre cannabis and firm the compost gently around it. Water and replace in your grow room. 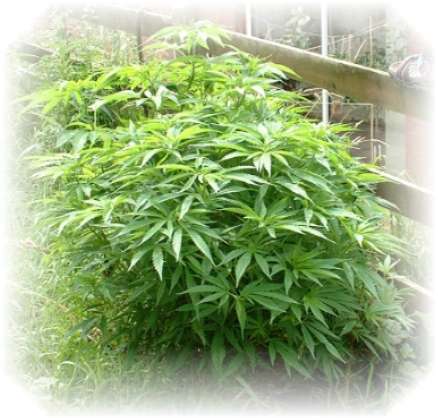 Now would be a good time take a cutting or two from the bottom or top branches of your plants. The soft shoots root quicker. Remember! Any work done on the plants would need to be done at the time when the lights are on. Do not upset the plants hours of darkness. One or two days later, take your cuttings. Start again from step one so that you have more plants ready and a continuous supply. Your plants in the 7.5 litre pots are ready for harvest in about another 4 - 5 weeks, when the white hairs, which are the female flowers, start to go brown. To ensure a continuous supply, every time you take a big plant out, you should replace it. 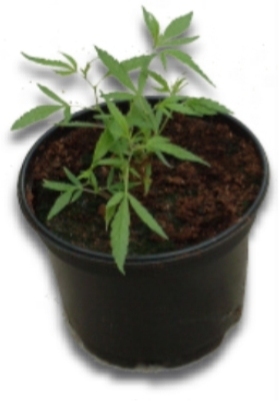 Every time you take a plant out of a middle size cannabis, you should replace it, and every time you replant a cutting you must remember to replace it. Eventually you will get the knack. Practice makes perfect. If your leaves start to go a little brown you may be over feeding. A remedy for this would be to water the plants without any plant food the next time and then go back to feed. When harvesting these plants, remember, this is a sacred cannabis. Do not kill the plant. Harvest the plant buds and leaves but leave enough of the plant so that it can regenerate outside in the garden or greenhouse. These plants will grow back in the summer and probably bigger than before. Just plant the remaining plant outside somewhere and God willing it will grow back and you can use it for cuttings and you will also get a second harvest which will be the proper Santa Maria. Grown outside in full sun and all its glory. Another idea would be to keep one of your grown cuttings in your house somewhere as a house plant. During the summer it will grow well and could be your eternal stock plant. In winter you will have to put a strip light over it or behind it so that it doesn't flower and can be kept as a stock plant for taking cuttings. 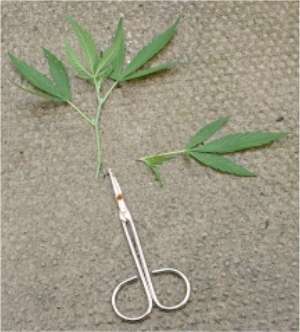 It is much easier for cuttings to take root if they are not in flower. Do not spray your plants with chemicals of any kind. Keep off the chemicals altogether. If any bugs start coming into your grow room ask them to leave. I put one green fly onto another plant and put it out side I have had no trouble since. If you fight them you will be infested. The turn around on this operation is so quick that you should have very little trouble. Some people have trouble with red spider mite. You can buy predator mites which eat these but I think if you wash your pots in water before you use them you should have little trouble with any thing. I heard one man burnt all his crop because it had red spider mite. What a waste, if he would have harvested his plants and hung them upside down, the red spider mites would run up the stem leaving the buds clean and clear. I have seen it with my own eyes! When harvesting your plants. Dry them quickly in a warm place. A warm airing cupboard or near a radiator for example. Make sure the grass is completely dry before you put it away for storage otherwise it will go mouldy and unsmokable. 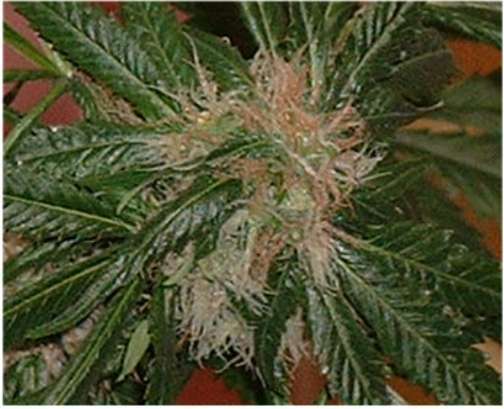 Once dry, if you can store it for about six weeks, you will notice it gets much more potent than when it is first dried. However, if you have a good quality grass, it would be quite good as soon as it is dried. Roll neat cigarettes or inhale through a pipe. If you don't smoke see other recipes. If growing from seed the operation is the same. However not all seeds grow into a plant with high THC levels which, if we are honest, is what we all want. Label your plants i.e. put a number on them. If you do this you can take a cutting or two from each plant, and after harvest when you find out if any of them are good, you will know which cuttings are the best. 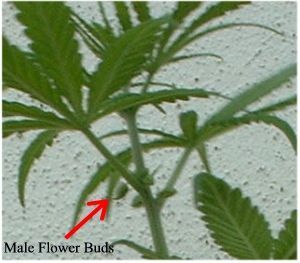 You will also have to watch out for "male" plants and remove them from your grow room, unless you want a grow room full of seed; and nothing left to smoke. You can however, take a small bud from a male plant, and do a little selective pollination. Just dust one branch, separately, away from all the other plants. There are also a lot of varieties of seeds. Some will grow fine if you put them directly under 12 hours light. Others, like outdoor varieties, will not grow very well indoors on 12 hours, and would have to be started off with more light. Outdoor varieties grow very stumpy if put directly under 12 hours light. Whilst others would grow perfectly under 12 hours from the very start of germination. When germinating your seeds put them directly into a small cannabis of compost and water and get them into light. If you don't know what type of seeds you have, you should grow them on the window sill during the day, and in the grow room at night under your light just for a couple of weeks this should give them enough of a start in growth before they go in the 12 hour grow room. Your plants will not flower until they have been in the 12 hour grow room for a week or two so you will not know whether your plant is male or female until it is only getting 12 hours light. The plants grow, but will not flower, on more than 12 hours. That is why cutting lamps are kept on 24 hours a day, just to get growth.. The plants flower and grow on 12 hours. This is the very best of my knowledge. The information I have written here is true and used. God Bless. Oh yes, I forgot to tell you, if you pray whilst smoking cannabis, its puts you in a higher dimension. Try it! You will understand more, when stoned, than when straight. I have read a Course in miracles time after time. The book, is a God send, but you can only really get to the depth of it when you have had a good smoke. If you find you are a paranoid person you may find this book truly helpful. When your mind starts to wonder, thinking things that are not true or that make you feel bad; you have lost your spirituality. You will know when you are thinking incorrectly because you will feel bad. Get back to God everyone. Pray. Read A Course in Miracles. You will be enlightened and your life will be much better than before. You will be happy. When you realise that all it takes is for us to start living right, keeping the commandments, watching out for ourselves instead of looking at everyone else's errors then the world will be a better place. Commandment no 1. Love the Lord thy God with all your heart all your soul and all your mind. Commandment no 2. Love thy neighbor as thyself. 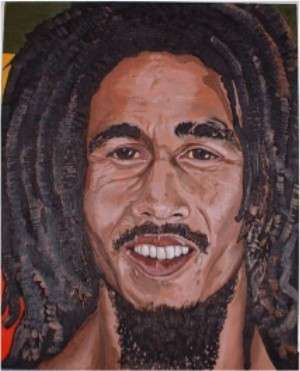 "BOB YOU DID YOUR JOB"
"IN MY HOUSE THERE IS A PICTURE ON THE WALL RASTAFARIAN SIT UPON HIS THRONE!" Love to everyone, Doris the Gardener. "Researchers at the National Institutes of Health (US) have found that two of the constituents of cannabis can help prevent the brain damage which often follows a stroke. These are cannabidiol (CBD) and tetrahydrocannabinol (THC). More research is needed but the scientists have found that the two chemicals behave like antioxidants (e.g. vitamins C and E). which give off electrons and protect cells from damage. Lester Grinspoon of Harvard Medical School commented. "Critics have insisted for a long time that cannabis must damage the brain. Now it turns out it might actually be neuroprotective. (protection for the nerves) I'd say we've come full circle." "Martin shows sympathy for medical cannabis trials"
"THE Minister for Health has expressed some support for setting up trials in Ireland into the medicinal use of cannabis. Micheal Martin said last week that he would be prepared to give "serious consideration" to granting a licence under the misuse of Drugs Acts if an application was made to conduct Irish clinical trials into the therapeutic use of the illegal drug. Sufferers of medical conditions such as multiple sclerosis (MS) and glaucoma have said that using the drug helps to relieve symptoms. Martin said he was aware of the claims of benefits from cannabisuse, but these claims were not supported by medical research. However, he said if he received an application for a licence under the acts, and this was approved by the Irish Medicines Board (IMB), he would be prepared to seriously consider allowing the trials. Any Application made to him for a licence to research the therapeutic use of cannabis would have to be referred first to the IMB. A spokeswoman said anyone wishing to carry out trials would have to send the data on the planned trials to the IMB for assessment. The board then makes a recommendation to the Department of Health on whether the trials should go ahead. The health minister's role would then be to rubber-stamp the project on the recommendation of the board. MS Society general manager Michael Dineen said he would welcome the setting up of independent clinical trials but he believed there were few Irish organisations with the resources, or the interest, to carry out such trials.